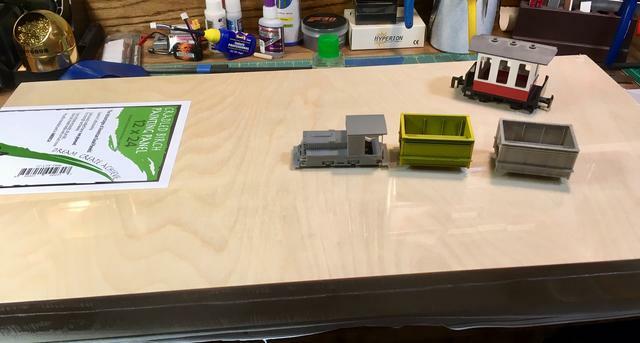 Freerails > Model Railroad Forums > Micros Minis Switching & Pizzas > 'The Lazy F Tramway' On20 In 12" x 24"
'The Lazy F Tramway' On20 In 12" x 24"
I decided to get back into Model Railroading after a multi year break with a micro layout. I'm building my version on a 12" x 24" baseboard. It's a Cradled Birch Painting Panel I bought on Amazon. The scale/ gauge is On20 which is 10.5mm. Motive power is a regauged Grandt Line On2 5 ton Plymouth. It's a simple conversion that I did nearly 20 years ago. It's sat in a box for years. Now to give it a home! Rolling stock include Grandt Line Koeppel side dump cars with appropriate wheelsets. The Gnomy car in the picture will be converted to a less toy like crew car. There is an article in an old NG&SL Gazette showing how. A flat car, tank car and powder car are in the works. 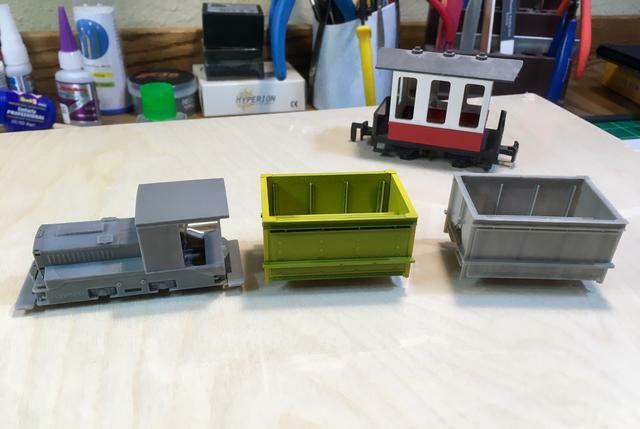 A close up of the rolling stock in various stages of completion. I'm not sure what I will use for couplers yet. Since it's a switching puzzle layout I want a simple way to connect them. Now to finish the design before I start laying track. Is there a way to edit the topic title? I forgot to include the scale and gauge. Well yes there is. Thanks to whoever changed the title! A link to my Gila Tram layout, a small On20 line which I now have in my "office" and run every day...mostly. There used to be an active Yahoo group for On20 but I haven't heard from them in years, probably because "things (scale/gauge) change". Have fun and run a train today.
" Motive power is a regauged Grandt Line On2 5 ton Plymouth. It's a simple conversion that I did nearly 20 years ago." I've always had a bit of a soft-spot for the lil' & funky Grandt Plymouth. But have never been doing the right scale etc. to use one. An On20 re-gauge sounds like a good move to me. I haven't seen that one before. The centre-pivot sector-plate is good & not as obvious a space-saver as it seems. OUCH ! ... What are you going to do for the curved(ish) 60/90-deg(ish) crossing ? Looks to be a C L project ! People often seem to want to hide them (as said on ^^ trackplan). Not an easy task to accomplish. But, hey ! ... There WERE such things & not hidden behind sheds either ! W C Greene wrote: A link to my Gila Tram layout, a small On20 line which I now have in my "office" and run every day...mostly. Thanks for the link Woodie. I'll take a close look at it. Si. wrote: " OUCH ! ... What are you going to do for the curved(ish) 60/90-deg(ish) crossing ? 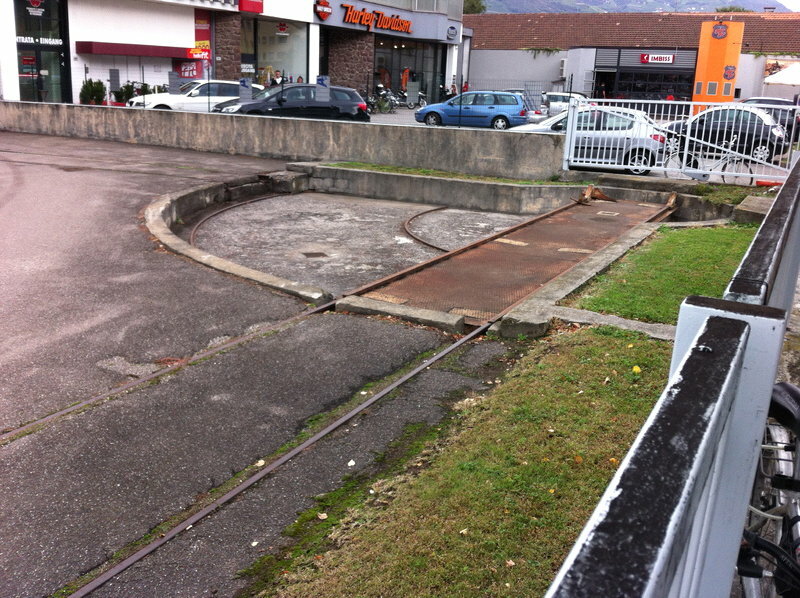 I think that's the big tracklaying challenge on this plan. I'm using Code 70 rail so there shouldn't be tons of filing and soldering....I hope! Nice proto sector plate picture. I'm not hiding the sector plate on this layout so that operation is as easy as possible. ... & suddenly twigged ... it's SWITCHLESS ! But with about TWICE as many crossings as most people have ! ... running along the front to the 'small office', which could even be a 'small engine house' ? The switchless part was what drew me to the plan. I didn't want to handlay the turnounts. Then I started looking at the crossings and the wiring looks a bit daunting. So I'm exploring converting the Plymouth to dead rail battery power. Thinking I might go for a DelTang unit in a small car right after the locomotive. Not sure yet.